883 | I Love Cafe Racers!!! As you may or may not know, I like Sportsters. I have 2005 883 myself, and have been converting it into a cafe racer for the last two years. Cafe conversions of the XL are fairly few and fair between relatively speaking, so when one comes up for sale on eBay, or I find one elsewhere, it tends to end up posted on the blog. What we have here is a 2002 XL 1200. What does buying a 1200 and not an 883 get you? About 20 extra horsepower and dual front discs. While this bike has some nice mods done to it, it is far from complete. The clip-ons are there. The fender has been bobbed nicely. The bike has the black-out treatment on lots of the parts. It’s got to have a new exhaust. I don’t even want to think about how loud the stock head pipes run without mufflers must be. and it probably has moved the power band completely to the top end. I’m going to guess that the carb has been set up properly given that the bike has cams and head-work done to it. Oh yeah, did I mention how loud it probably is? The wheels: stock Harley wheels are heavy! It needs something lighter. Sportsters can be made relatively light compared to their portly weight in stock form, but one of the most important weight-loss procedures is losing the factory boat-anchors. 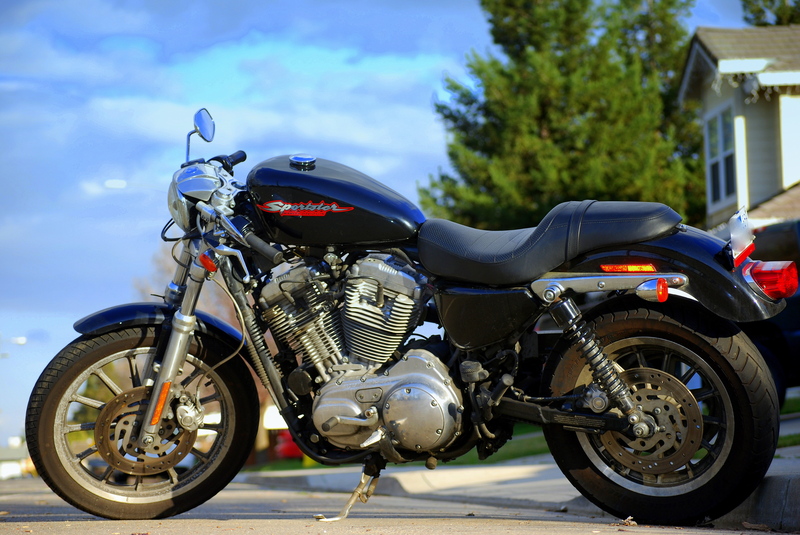 Plus, Sportsters with 18″ 40-spoke alloy rims built up on nice, stock alloy hubs look really sweet! Three sets of foot pegs: it’s got three! Pick any two and get on with it. Rear-sets would be best, but lose the highway pegs if nothing else. I commuted yesterday and today. On my bike. It’s been like two months since the last time I rode it any further than just across town. I had been worrying about the “death rattle” noise that has been emanating from the lower left side of the motor. I changed the oil on Monday night, then rode around town hoping that the noise had gone away with the fresh synthetic in the oil tank. The noise seemed less as I revved the hell out of it away from the stoplights. Then I rode it to work. Oh boy. At steady states of cruise, the noise is back. With a vengeance, I might add. At around 65-70 mph, it sounds awful. At 75 mph, the noise lessens, and then at 80 mph it disappears, but then the bike sounds pained as it wheezes its way down the highway. My next step is to change the transmission oil and check the primary drive chain. I hope it is something simple, as I really don’t have the time or money for a full tear-down and rebuild.